It is nearly impossible to grow up in America during the years past 2000 without hearing something about Pakistan, Iraq, or other Middle Eastern countries. However, with all of the negative stigma centered around that region of the world, we rarely hear about people who change the world for the better. Since it is common knowledge that some countries in the Middle East enforce religion, and require women to follow a different, very specific set of rules compared to men, it is common for people to totally underestimate the role of these women all together. With this being said, it is even rarer to hear about a Pakistani woman who has changed the world. This doesn’t, however mean that they don’t exist—Benazir Bhutto is a prime example of such a woman. Despite her culture, the societal norms within that culture, and life in a country where higher education for women is atypical, she was able to make a major impact on her country and the world around her. In reading “Pakistan” (2013), one discovers the cultural background of Pakistan is very different that of the United States. In this culture—where Benazir Bhutto was raised, the languages spoken are quite diverse (Pakistan, 2013). The official language is Urdu, although it is the first spoken language of only around 8% of the country (Pakistan, 2013). 48% speak Punjabi, 12% converse in Sindhi, 10% use Saraiki, 8% speak Pushtu, 3% chat using Baloch, and 11% speak some other language. English is also spoken but only by a very few, very “elite” group of people (Pakistan, 2013). Benazir Bhutto spoke two of these languages—Urdu and English (Pettinger, n.d.). ultimately be decided on by a man in her family. These circumstances created a struggle for women like Benazir Bhutto who had ambitions and dreams for themselves or their country. In defining culture, it is rational to include the typical family structure of that society. In Pakistan, the norm is a patriarchal ideology, meaning that the father is the head of the family (Pakistan, 2013). This follows the societal norms tied to woman in Pakistan, as well as the religious backgrounds of most of the residents of Pakistan, which is Islamic (Pakistan, 2013). This was not the family structure of Bhutto’s family, however, as her father did not necessarily have these views. In fact, while her father was in office, he“liberated women and minorities from their second-class positions”, and appointed the first female governor (Bhutto, 2008). 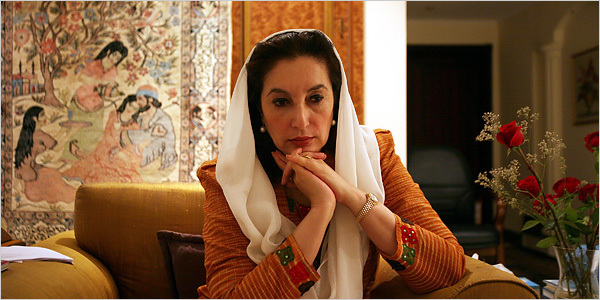 opportunity—she passed all of her A-levels (Pettinger, n.d.), went to Radcliffe College at Harvard University at just age 16 (Benazir Bhutto—Pioneer for Democracy, n.d.), attended Oxford University to study Law at Lady Margret Hall College, and went on to become president of the Oxford Union (Pettinger, n.d.). 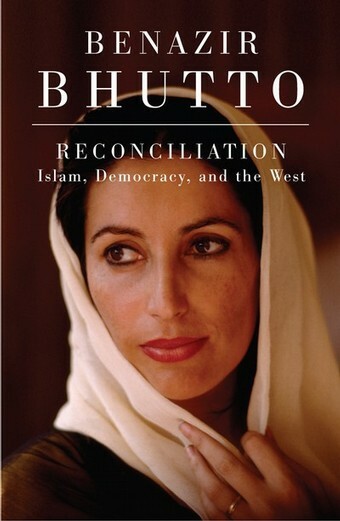 In her book, Reconciliation (Bhutto, 2008), she talks about how during her time at Harvard, Pakistan was in a military dictatorship, and went on to discuss that although there was free vote during this time, “the mandate was not honored when two parties swept the two wings of East and west Pakistan”. Beyond this, she recalls observing how the power of the people in America change and impacted American politics, and realizing that it was so basic in America, that often times, people took their amazing rights for granted. In this book, Bhutto describes how the willingness of the American people to stand up for what they believe in, and to assert their power strongly influenced her life and future decision (Bhutto, 2008). 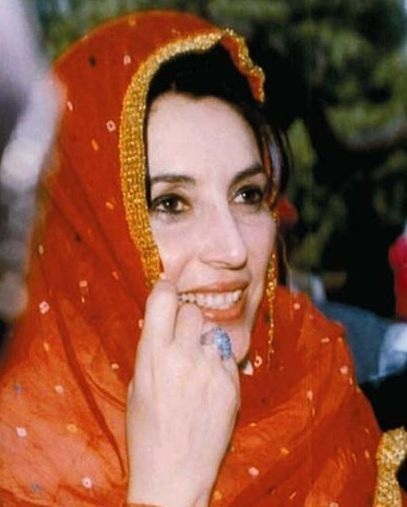 of Achievement, n.d.), she returned to Pakistan, where her father’s party—The Pakistan People’s Party— was elected, making him Prime Minister of Pakistan (Bhutto, 2008), (Pettinger, n.d.). Shortly after she arrived however, the military took over, and imprisoned her father (Academy of achievement, n.d.). hands in sheets” (Bhutto, 1981) (Pettinger, n.d.). After studying outside of Pakistan for such a long time, Bhutto had a strongly formed opinion on what the correct form of politics was, and when she was released from house arrest in 1984, she started to rally to restore the Democracy that her father initiated (Pettinger, n.d.). She wrote that once it was time for her to step into her father’s shoes and fulfill his legacy, “[she] led the struggle for democracy” (Bhutto, 2008). 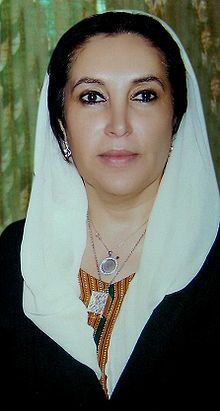 In leading the struggle for democracy, Bhutto became the first woman to lead a political party in Pakistan, which was called the Pakistan People’s Front, and shortly after the death of the current general, Pakistan was able to have its first democratic election in over ten years (Pettinger,n.d.). alongside her mother, she was elected co-chairwoman of the Pakistan’s People’s Party, and with the help of the people in her party, she was able to become the first woman to head the government of an Islamic state on December 2, 1988 (Academy of Achievement, n.d.). This was a huge accomplishment, and was highly celebrated, not only in her country, but others as well. She was quoted in December 1988 saying “we gather together to celebrate freedom, to celebrate democracy, to celebrate the three most beautiful words in the English Language: ‘We the People’” (Pettinger, n.d.). This was not, however, the end of the battle faced by Bhutto during her struggle for democracy. A short two years after being elected, the president at the time (Ghulam Ishaq Khan) dismissed her from office, which led to her anti-corruption campaign, which resulted in her re-election during the year 1993 (Academy of Achievement, n.d.) (Pettinger, n.d.). across Pakistan, and making hunger, housing, and healthcare her top priorities. Because of her uncompromising approach to negotiation with unions, she was often called the “Iron Lady”, and pursued different free market economic policies, although rising unemployment and inflation made such economic policies unpopular (Pettinger, n.d.). democracy and moderation had to, and would prevail, and that despite the threats of death, she was willing to fight for those rights (Pettinger, n.d.). third time (Academy of Achievement, n.d.). This, however, did not occur, because on December 27, 2007, Benazir Bhutto was assassinated (Pettinger, n.d. Academy of Achievement, n.d.). After her death, her son was quoted as saying “My mother always said, 'Democracy is the best revenge”, and she was named one of the seven winners of the United Nations Prize in the Field of Human Rights (Pettinger, n.d.). 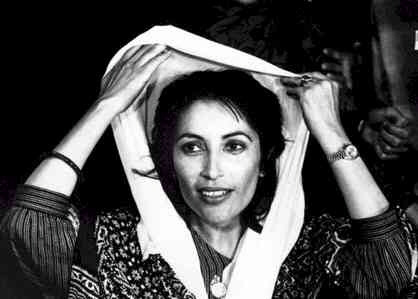 Though Bhutto did not have the time she may have wanted in office, she was able to impact the world through her persistence and struggle for democracy. She may inspiration to many, including women with similar cultural backgrounds. If you have a lot of time, watch this interesting interview! For a less time-consuming, but equally interesting interview, view the video in the column on the upper left.